The Wonder Twins are a pair of DC Comics superheroes with interconnected, shape-shifting superpowers, sometimes playfully or mockingly alluded to for other closely bonded duos. Grace and I just got referred to as "wonder twins"
In the long history of tech rivalries, rarely has there been a battle as competitive as the raging war between the web's wonder twins. Where does Wonder Twins come from? The All-New Super Friends Hour cartoon ran on TV from 1977–78. It featured kid-friendly versions of DC Comics’s Justice League characters, including Wonder Woman, Batman, and Superman. Alongside these well-known superheroes, the cartoon debuted several original characters, notably the identical twin brother and sister Zan and Jayna, aliens from the planet Exxor who call themselves Wonder Twins. 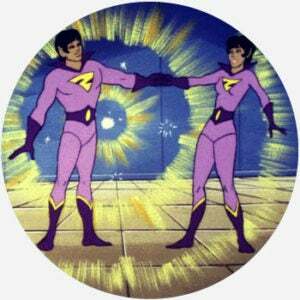 To use their powers, the Wonder Twins would bump fists and say “Wonder Twin powers, activate!” Jayna could then transform into any animal and Zan could take various, and often improbable, forms of water (e.g., an ice unicycle). In the cartoon, the Wonder Twins also had a pet alien “monkey” named Gleek, who could elongate his tail and use it as a weapon. The quirky Wonder Twins weren’t exactly acclaimed by DC Comics fans, but the characters have been variously reincarnated, and to greater critical reception, in the 1990s and 2000s. In 2009, Zan and Jayna made their live-action debut in the Superman prequel TV series Smallville, where they were presented as well-meaning but inexperienced superhuman vigilantes, rather than aliens. In 2013, Wonder Twins received more pop-culture buzz when comic fan Pat Evans created a hoax poster for an imaginary big-budget Wonder Twins movie, casting Mila Kunis as Jayna and Ashton Kutcher as Zan. A real movie has not yet manifested, but DC Comics still sells Wonder Twins memorabilia today, including toys, t-shirts, and costumes. The duo made a nostalgic cameo in the 2017 Lego Batman Movie, with concomitant merchandise. Wonder Twins may also refer to a set of actual twins, siblings, very close friends, or successful rivals achieving something notable in public life. This description doesn’t necessarily allude to the characters, however, as wonder can more generally describe a remarkable person (e.g., wonder kid, wonder mom). As the original Wonder Twins are often seen as corny and gimmicky, people may also ironically use the Wonder Twins as insult, à la Tweedledee and Tweedledum or Rosencrantz and Guildenstern. Two closely working politicians viewed as cronies, for instance, could be mocked as the Wonder Twins of Washington.